Those are strong words from the ivory tower and quite the endorsement of Jewish summer camp. But Eisen wasn’t the only head of a major Jewish academic institution who lauded Jewish summer camping at the Foundation for Jewish Camp’s recent Leaders Assembly. He shared the stage with Richard Joel and Rabbi David Ellenson, the presidents of the Orthodox and Reform academies respectively, who both agreed that the answer to Jewish continuity can be found at summer camp. All three academicians extolled the virtues of the summer camp experience for young Jewish children who seamlessly go from overnight hiking and canoe trips to Friday evening Shabbat services by the lake. 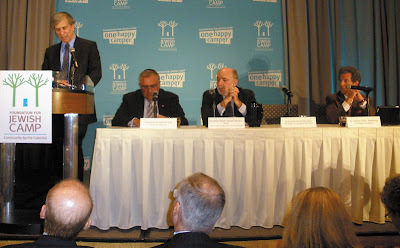 The leaders of Yeshiva University, the Jewish Theological Seminary, and Hebrew Union College took turns standing in front of 400 Jewish camping leaders at the FJC gathering – from camp directors to donors – to explain how their denomination would help to grow the Jewish camping phenomenon in the coming years. These schools train Jewish educators – most of whom discovered or strengthened their Jewish identity at summer camp – and with a $45 million investment from the Jim Joseph Foundation (divided among the three institutions) they will be able to prepare more young people who wish to work in the informal Jewish educational field of Jewish camping. Most Jewish summer camps are nonprofits and, historically, have not been able to compete with the lavish facilities and stellar sports programs at the privately owned for-profit camps. But that is changing. Over the past decade the hottest cause for major philanthropists in the Jewish community has been funding the growth of Jewish summer camps, which means seeding new camps and ensuring there are ample need-based scholarships to afford all young Jewish children the ability to experience the magic of camp. Camp leaders have long recognized that a main reason more young people don't make Jewish camping part of their annual summer experience has been because they choose to focus on one interest like drama or a particular sport and seek out camps that specialize in those activities. FJC has put its attention into funding such specialty camps that concentrate on one main interest category but also infuse the Jewish magic for which Jewish camps have been known. FJC was able to open five new camps in 2010 as a result of the first Specialty Camps Incubator – based on a business incubator model – and now the second wave of that program has been launched resulting from the $8.6 million investment by the AVI CHAI Foundation together with the Jim Joseph Foundation. There seems to be something inherently Jewish about summer camp. Indeed, when Jewish adults gather the conversation inevitably turns to Jewish camp memories filled with nostalgia. When two adult Jews meet for the first time, the game of “Jewish Geography” ensues and “Which camp did you go to?” and “Did you know so-and-so who went to that camp?” are the unavoidable questions. No matter what the activity – from baseball and boating to crafts and campfires – the social aspects of Jewish camp all play out in a constant Jewish milieu. The benefits of those summer experiences are reaped over the course of a lifetime for the Jewish individual, and in turn for the Jewish community as well. Spring is upon us and we are now focused on Passover, but thousands of young Jewish children are already counting the days until school vacation and their own exodus to the freedom of another memorable summer at Jewish camp. Great blog. Two points I would like to share about Jewish camp experience. The first relates to my own children. My son and two daughters went to Ramah in the Berkshires for many many years. They stayed on as tzevet/staff and became roshei edah/division heads(the Hebrew translations are not for you, but for any others who may..) Two of my kids fell in love and married people they met at camp(the third met her spouse at List College/JTS). Now as parents themselves their children are attending Ramah Nyack Day Camp where children are special and the staff has an incredible Jewish experience AFTER the campers leave each day at 4PM. PLUS. One daughter Nava is a rosh edah and a daughter in law Erica is too..while daughter Ilana is the president of the Ramah Alumni Association of the Berkshires. POINT #2 Camp is not only for kids. For the 8th year in a row I shall be the rabbi in residence for CAMP HAZAK. Camp for mature adults/seniors. Held at Block and Hexter in the Poconos (not far from many Jewish camps). This year from June 28th to July 5th there will be more than 100..as many as 130 adults yearning for learning, for Shabbat, for tefillot daily, for Pirke Avot on the Porch before dinner, for 3 to 4 hours of classes daily. And with a beautiful lake, a heated outdoor pool, a fantastic health/exercise center,rolling landscape and entirely accessible for those who need, it is a powerful Jewish content week under the auspices of the United Synagogue. CAMP IS FOR JEWS of all ages. "...Over the past decade the hottest cause for major philanthropists in the Jewish community has been funding the growth of Jewish summer camps, which means seeding new camps and ensuring there are ample need-based scholarships to afford all young Jewish children the ability to experience the magic of camp..."
I hope that those same major philanthropists go one step further and fund disaspora teens who want to take their camping experience to the next level...by experiencing a real connection to Israel and their heritage through one of the meaningful programs that take place in Israel ie. EIE-NFTY, USY, AMHSI, BBYO and others!